This vacuum lifting tool grips, lifts and pitches large solar panels or boxes. The tool features our floating ergonomic handles with grip/release, proportional lift/pitch up/down controls, and float mode. The tool is integrated with a Gorbel Easy Arm and our custom gripper safety circuit preventing accidental release of the panels in midair. This vacuum lifting tool grips and lifts titanium parts. The tool features handles with grip/release and proportional up/down controls, float mode, and interchangeable vacuum grip heads. The tool is integrated with a Gorbel Easy Arm and our gripper safety circuit preventing accidental release of the parts in midair. 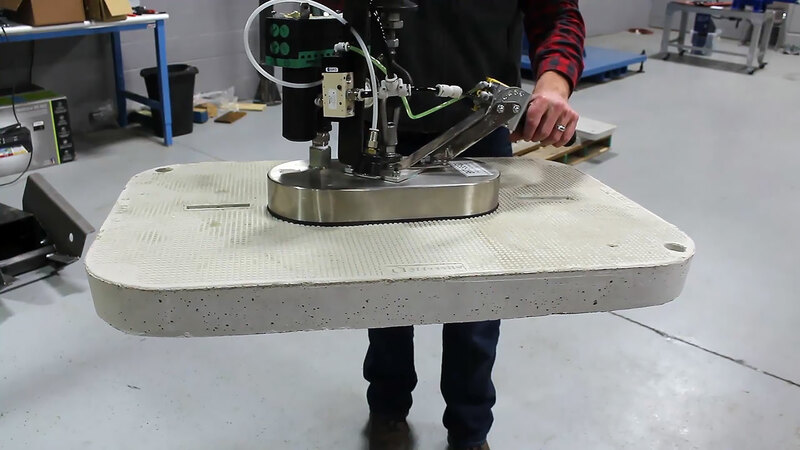 This vacuum lifting device is designed to grip, lift, and 90 degree pitch metal panels. The tool features proportionally adjustable pitch up/pitch down, and lift up/down controls. 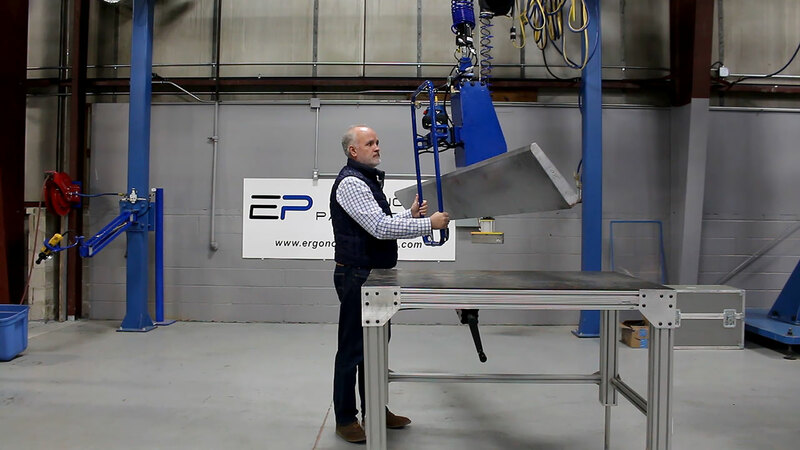 The vacuum lifting tool is integrated with an Easy Arm allowing the operator to quickly and precisely position the metal panels. 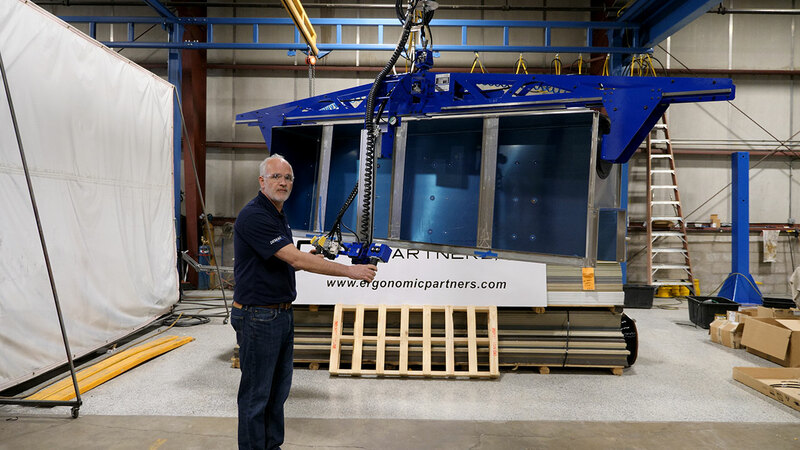 This vacuum lifting device is designed to grip, lift, and 90 degree pitch 400-pound glass panels. The tool features proportionally adjustable pitch up/pitch down, and lift up/down controls. 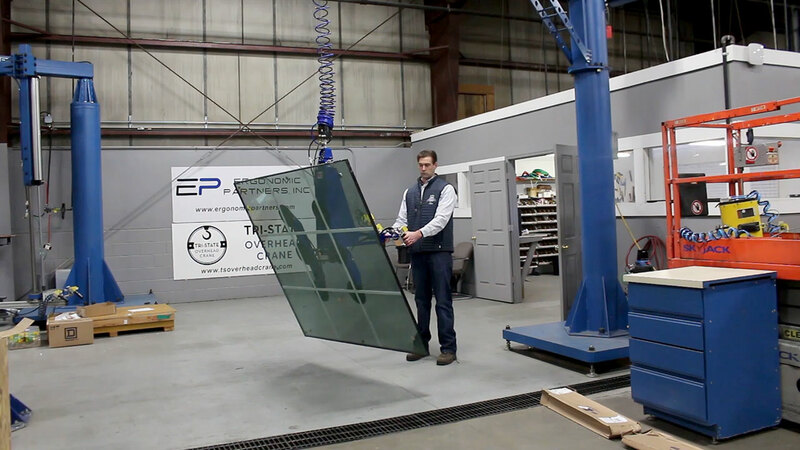 The vacuum lifting tool is integrated with an Easy Arm allowing the operator to precisely position the heavy glass panels. Designed for the transportation industry; this vacuum lifting tool grips and lifts porous parts. The tool features adjustable grip/release and proportional up/down controls, float mode, and adjustable vacuum cups. The tool is integrated with a Gorbel Easy Arm and our gripper safety circuit preventing accidental release of the parts in midair. 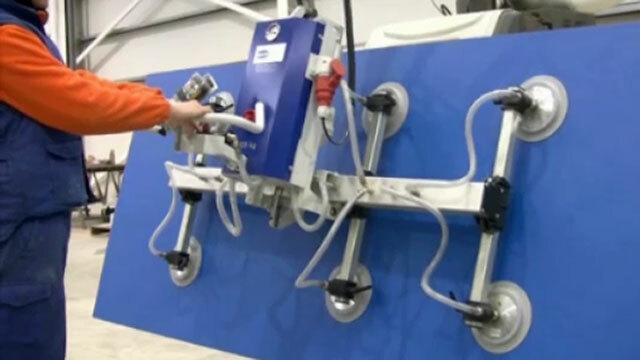 This vacuum lifting device was designed to grip, lift, rotate and pitch large utility transformer panels. The tool features an ergonomic floating handle, pivoting and quick lever adjustable vacuum cups, removable pendant handle, float mode, and our custom Gripper Safety Circuit preventing the operator from dropping the panels in mid-air. 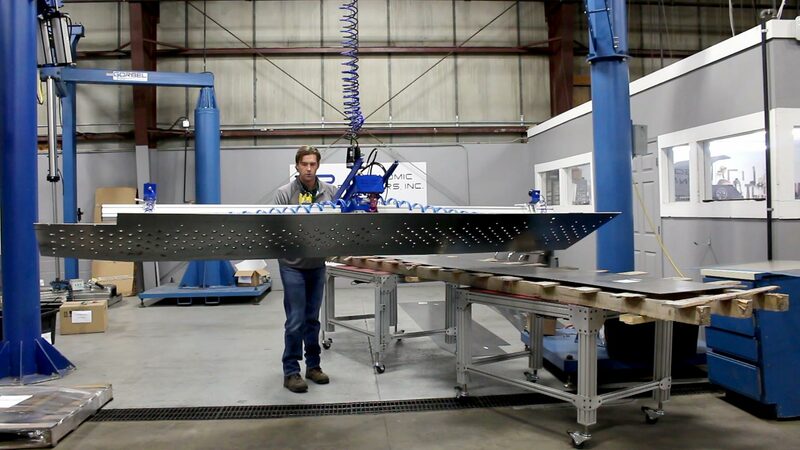 The tool is integrated with an Easy Arm articulating jib crane allowing operators to easily and accurately position the panels. This tool is designed to grip, and 180-degree rotate 200-pound parts. The tool features an adjustable grip track for lifting small to large coolers without damage. It is integrated with a Gorbel Workstation Bridge Crane and Demag Chain Hoist. Other features include: powder coated steel and aluminum frame, vacuum grip gauge, anti-drop circuit (prevents accidental release in mid-air), vacuum saving suction cups, up/down, proportional 180-degree rotate, and gripper width controls. 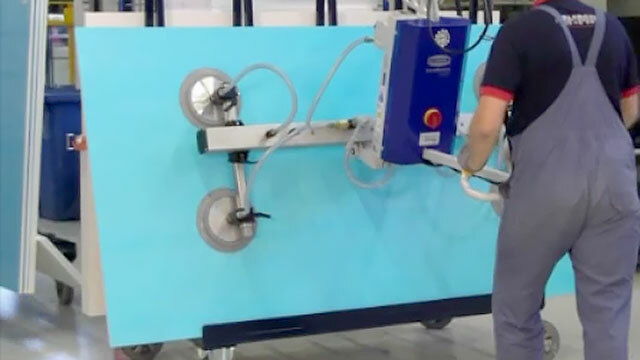 This vacuum lifting device was designed to grip, lift and pitch non-tempered glass panels. The tool features our ergonomic floating handle, momentary pitch, float mode and our custom Gripper Safety Circuit preventing the operator from dropping the glass in mid-air. The tool is integrated with an Easy Arm allowing operators to be extremely precise in the placement of the delicate glass. 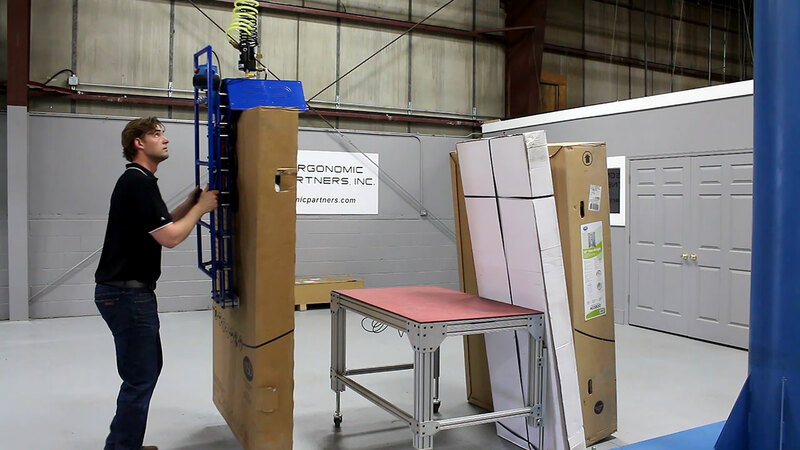 Custom vacuum lifter to grip and pitch 250-pound refrigerator panels. The tooling has a built-in spreader bar to allow for the pickup of a complete unit after assembly. This tool has two safety features, our Griper Safety Circuit that prevents the accidental release of the panel and our Residual Vacuum Circuit that prevents the operator from lifting the panel with residual vacuum left in the cups. 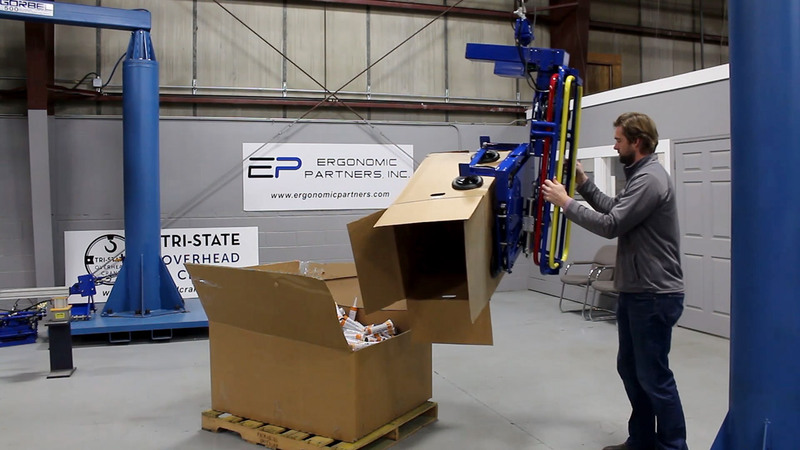 Ergonomic Partners designed and built this custom Vacuum Gripper to lift 150 pound boxes. The tool features our floating handles that allow the operator to lift the boxes in an ergonomic position throughout the tools vertical travel. 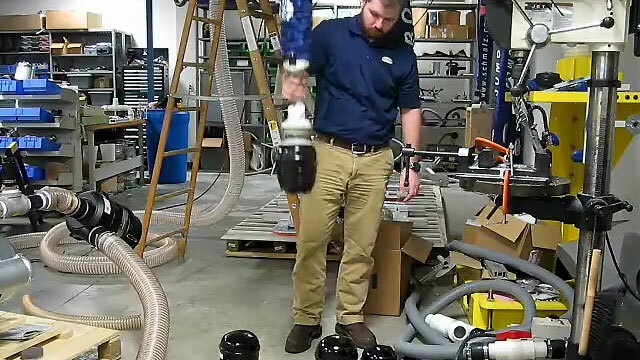 The vacuum lifter tool also includes our custom Gripper Safety Circuit preventing the operator from accidentally pressing the release button and dropping the boxes in mid-air. 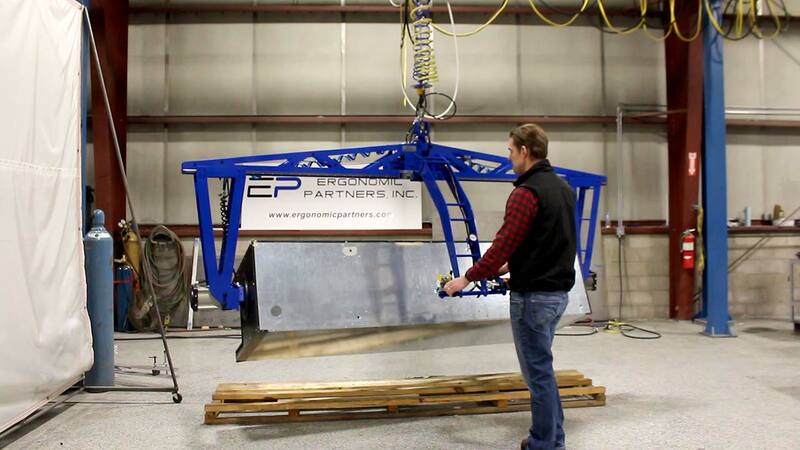 Ergonomic Partners designed and built this custom vacuum lifter for carbon fiber aerospace panels. 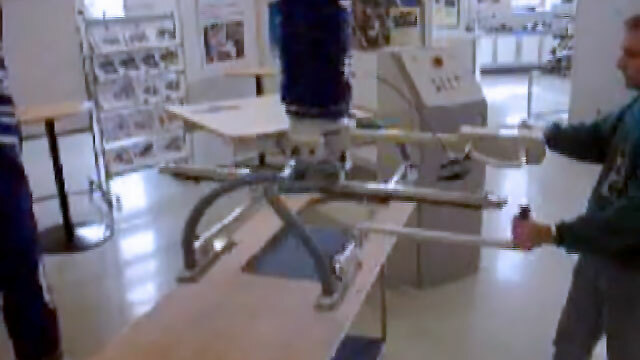 The lifter can be operated from a hand-held remote or by hand. 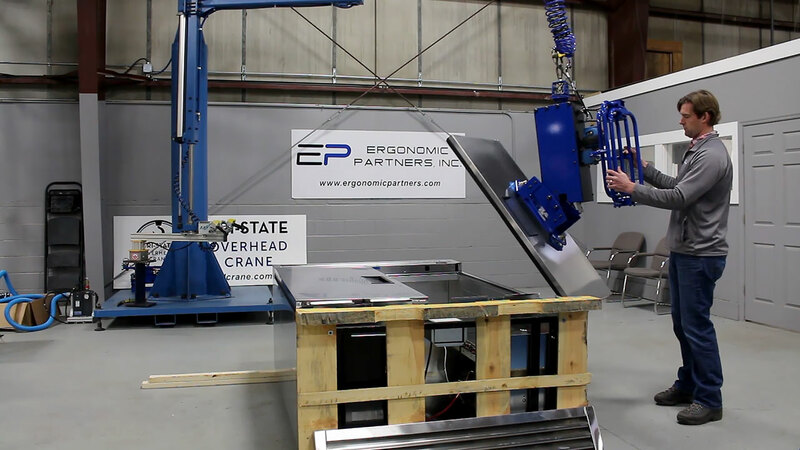 It lifts and rotates the panels 90 degrees and can lift the panel from the concave or convex sides. 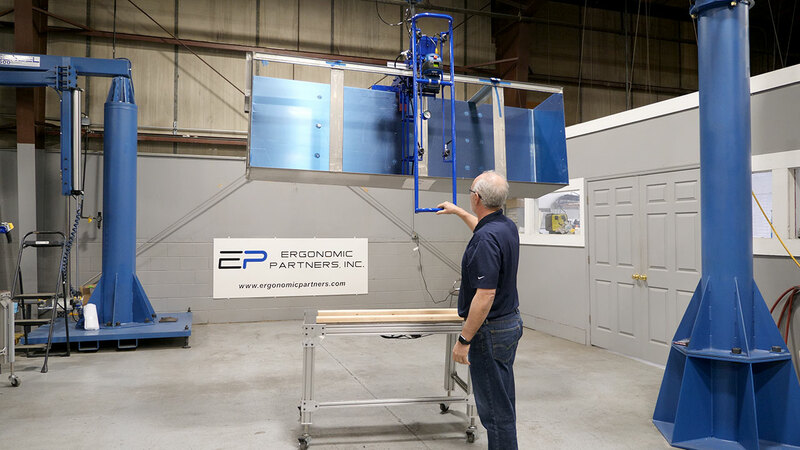 The vacuum lifter tool also features our custom Gripper Safety Circuit preventing the operator from accidentally pressing the release button and dropping the panel in mid-air. 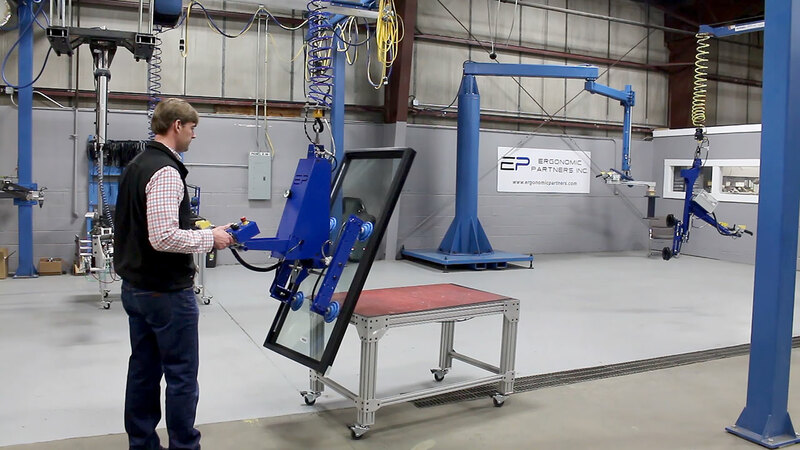 This custom vacuum tool grips, lifts, pitches and rotates 100-pound glass doors. Operators can position the doors using the proportional hand controls or by hand using float mode. 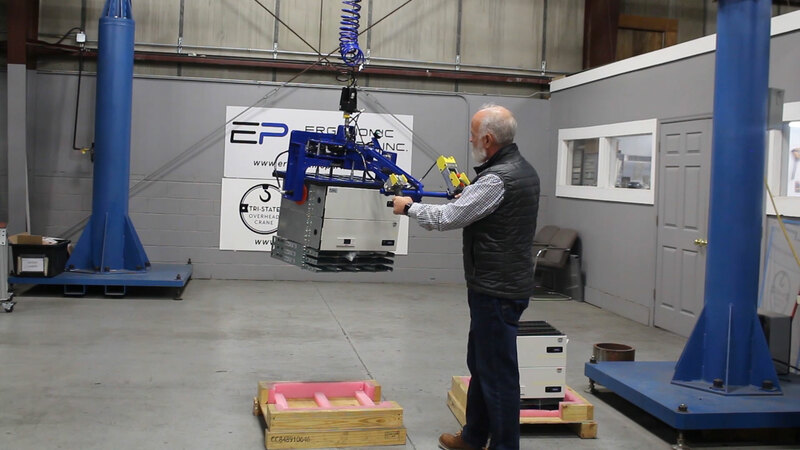 The tool is suspended from a Gorbel Easy Arm and features our custom Gripper Safety Circuit preventing operators from accidentally pressing the release button and dropping the doors in mid-air. 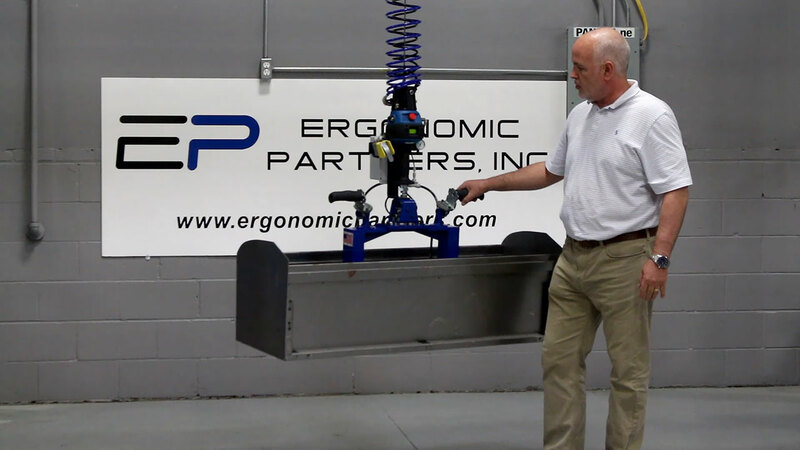 Ergonomic Partners custom designed this vacuum gripper to lift and pitch various 60-pound sheet metal parts. 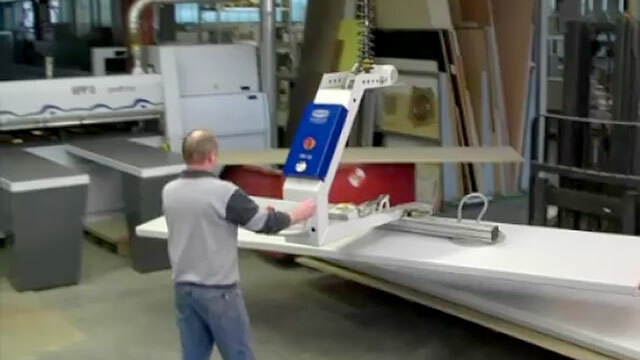 The sheet metal handling tool is integrated with a Gorbel G-Force intelligent lifting hoist and features our custom Gripper Safety Circuit preventing the operator from accidentally pressing the release button and dropping the sheet metal parts in mid-air. We designed and built this vacuum lifter for installing skid steer windows. 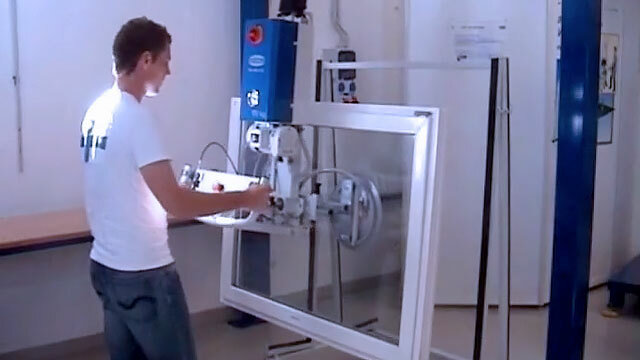 The lifter can be operated in zero gravity mode allowing the operator to position the windows by hand. The vacuum tool includes our custom Safety Circuit preventing the operator from accidentally pressing the release button and dropping the window in mid-air. 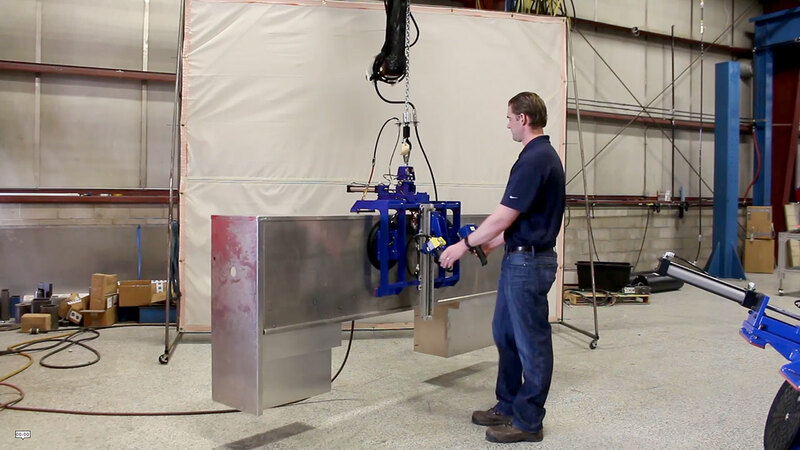 This vacuum lifting device is designed to grip and lift 400-pound sheets of metal. The tool features proportionally adjustable vacuum grippers for wide and long sheets. The vacuum lifting tool is integrated with a variable frequency drive CM LodeStar hoist allowing the operator to precisely position the heavy metal sheets. Designed and built to grip and lift and metal containers. 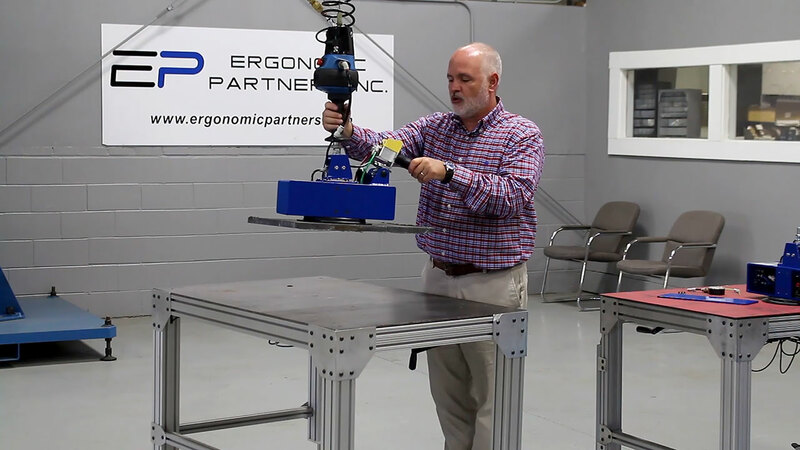 The gripper tool features our in-line ergonomic lift handle, and custom Gripper Safety Circuit preventing the operator from accidentally pressing the release button and dropping the converter in mid-air. This vacuum lifting device was designed to grip and lift large utility box truck beds. 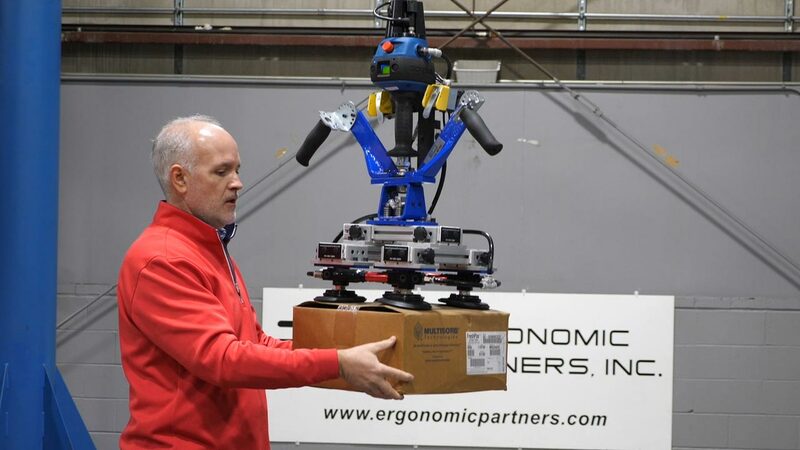 The tool features an ergonomic adjustable handle, automatic center of gravity shift, and our custom Gripper Safety Circuit preventing the operator from dropping the truck boxes in mid-air. The tool is integrated with a two speed hoist and workstation crane allowing operators to easily position the truck bed boxes. This tool picks up and pitches doors for installation on to the body of refrigerators. The vacuum grip tool has two operator modes: zero gravity mode or ergonomic hand control mode. The operator can switch between zero gravity or hand control mode by the use of a single push button. This tool picks up and rotates boxes so the contents can be emptied into a hopper. 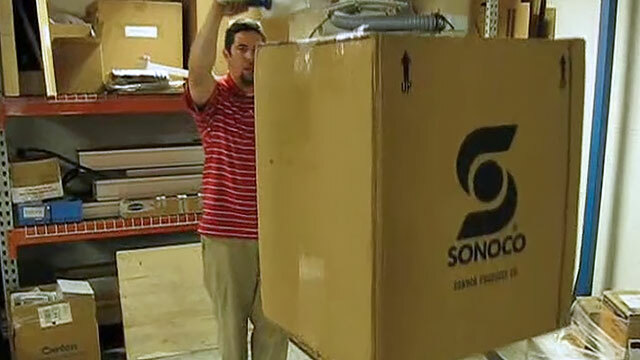 The tool has a 90-degree gripper which prevents boxes from flexing during the emptying process. 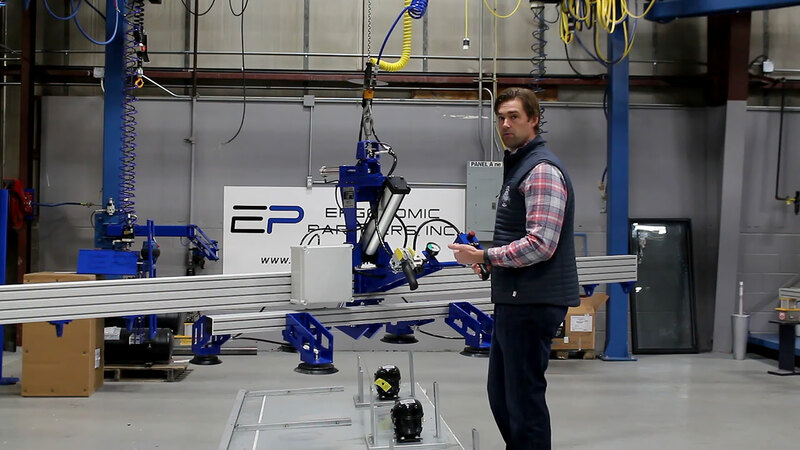 The vacuum grip tool is attached to an Easy Arm (smart articulating jib crane). Custom Sheet Metal Vacuum Lifter to Handle 300lb parts. Sheet metal handling tool has multiple cylinders that allow for quick and easy adjustment of the vacuum cups with the push of a lever. 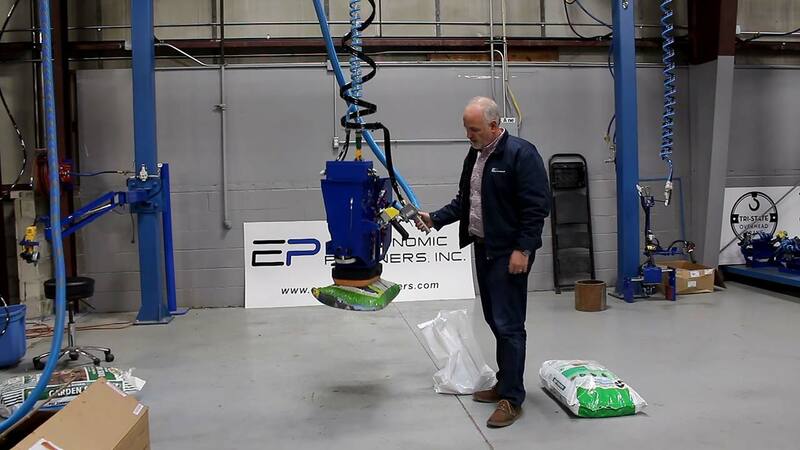 This lifting device picks up bags using two independent gripping methods. The operator can switch between the use of the vacuum gripper or the mechanical grip jaws to lift different types of bags. 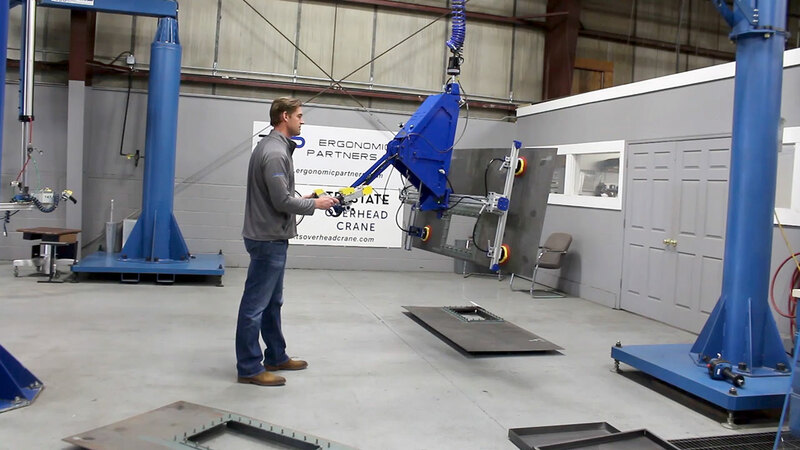 The tool was integrated with a pneumatic chain hoist and overhead crane. 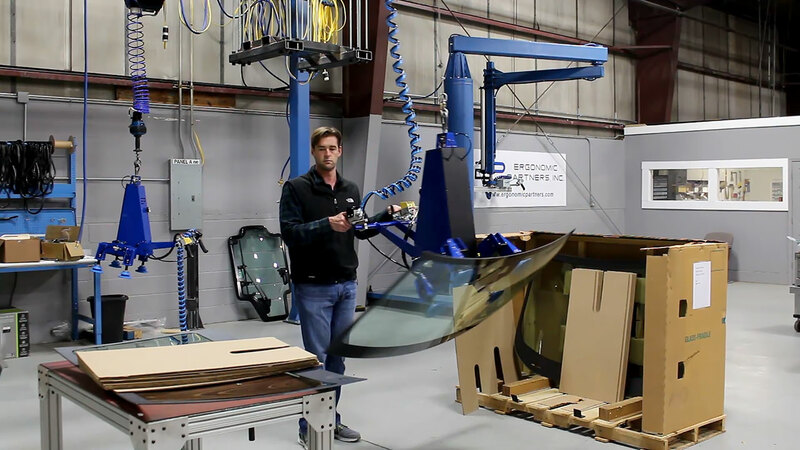 Designed to pick up and rotate 70 pound glass windshield doors for skid-steer front-end loaders. 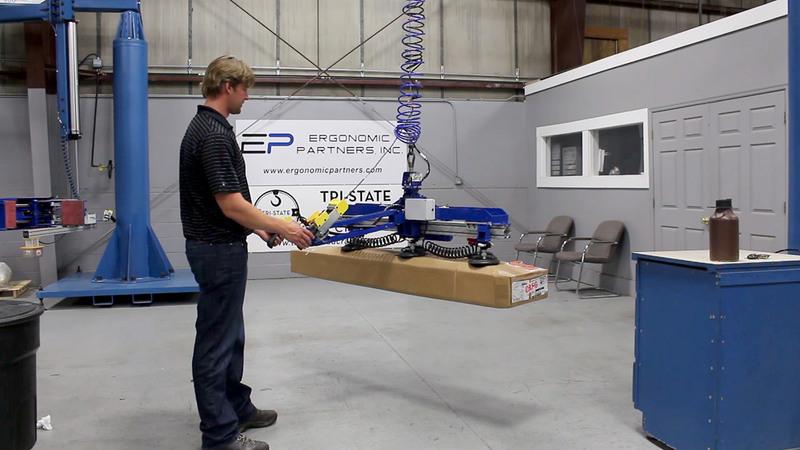 The vacuum lifting device is mounted to an Easy Arm™ intelligent articulating jib crane. 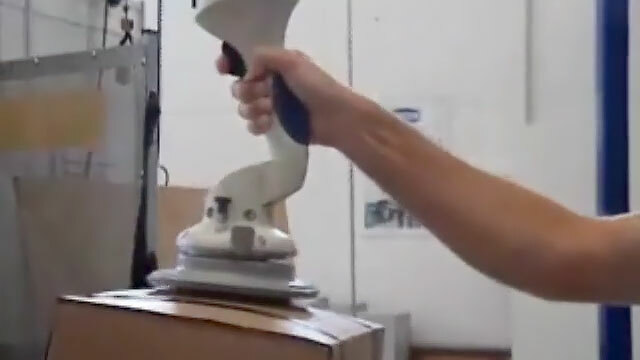 This vacuum grip tool picks up boxes from the side and has a custom high-low handle and zero gravity "float mode" control. 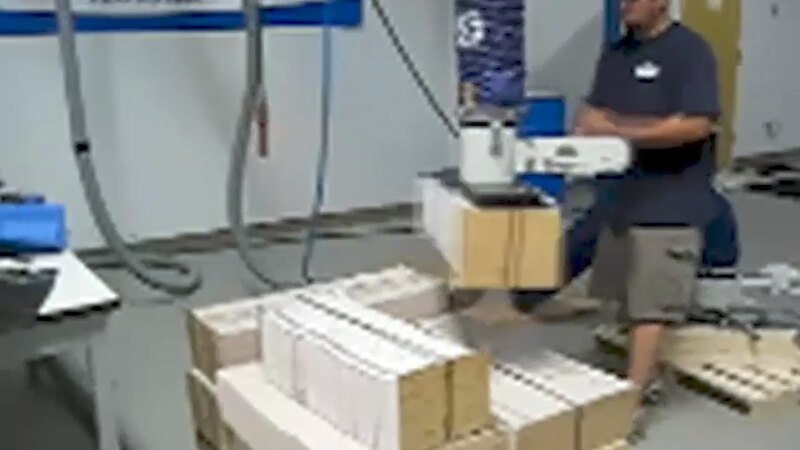 The tool is integrated with the Gorbel Easy Arm and features Ergonomic Partners force sensing handle design and gripper safety circuit which prevents the operator from releasing the boxes in mid-air. 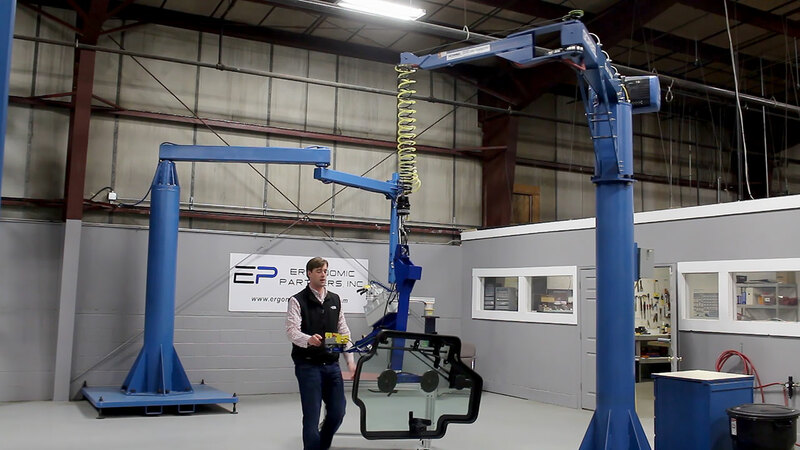 This vacuum gripper enables one operator to pick up and pitch large glass windshields. The customer was currently struggling to lift the awkward triple wall corrugated boxes. They were using two people to assist with the lifting and taping of the boxes. 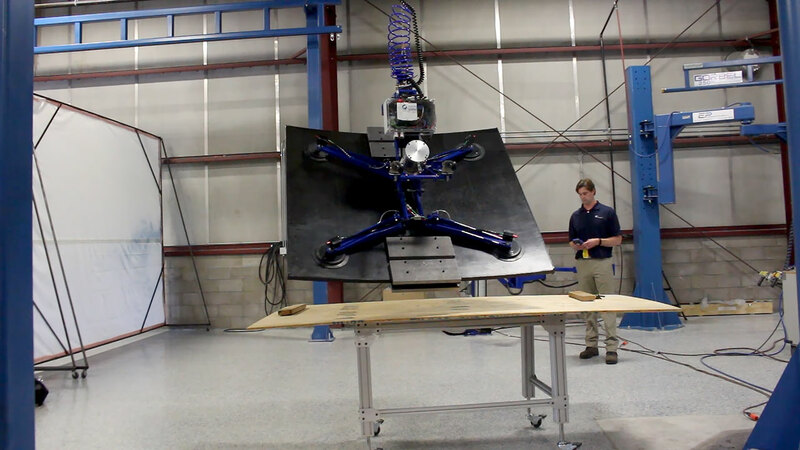 This allows one operator to perform the task faster while eliminating the risk of injury. 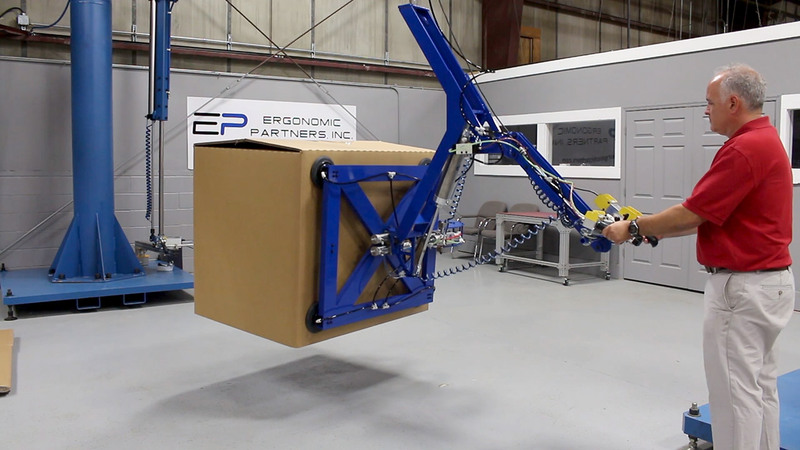 Vacuum gripper system designed to lift up to 150 pound boxes from the side. This tool is free from buttons or levers for control and features a force sensing handle for quick and easy lifting. 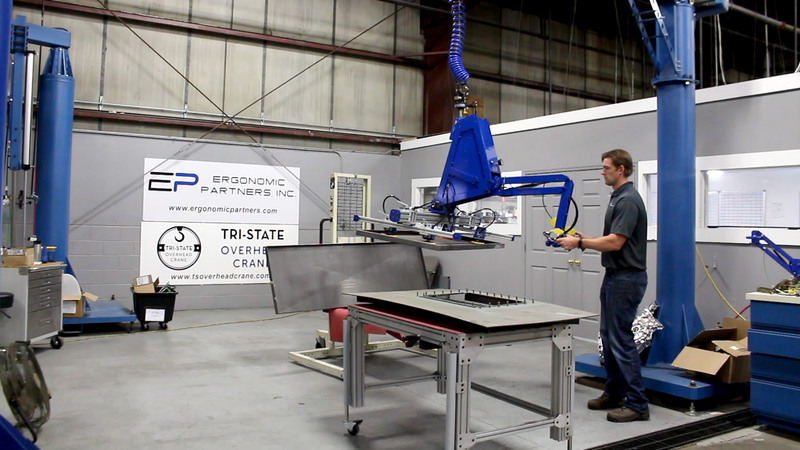 Vacuum Gripper system for loading 120 pound steel plates into a CNC machine. 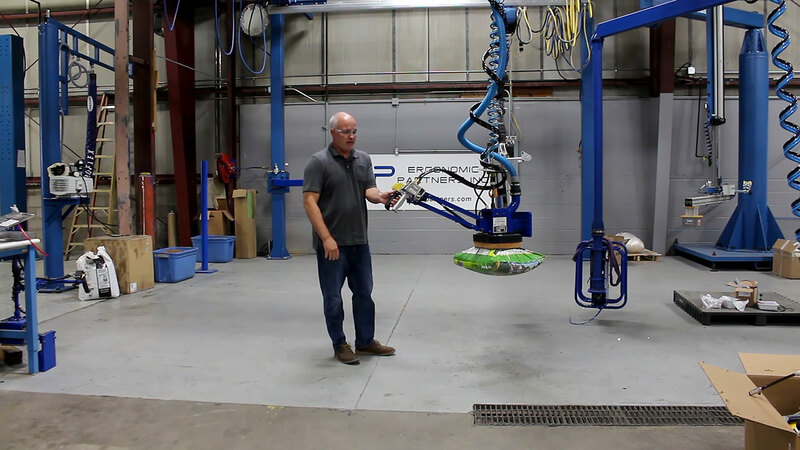 This tool was integrated with a 330 pound zero gravity arm. 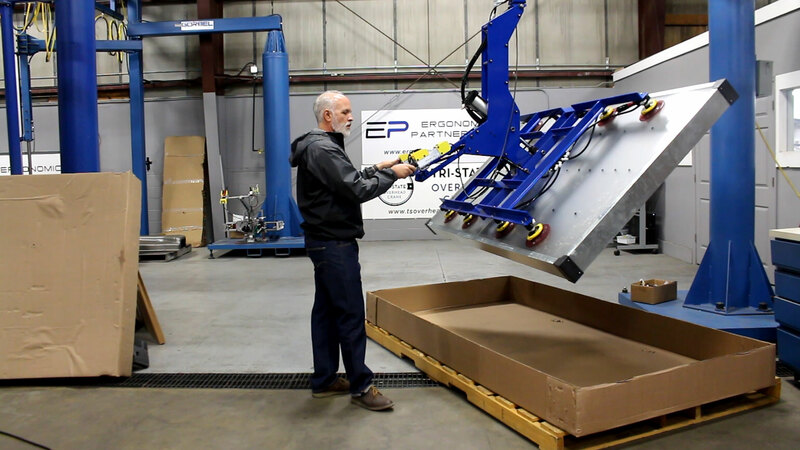 This vacuum lifting tool was designed for large flexible and porous boxes. 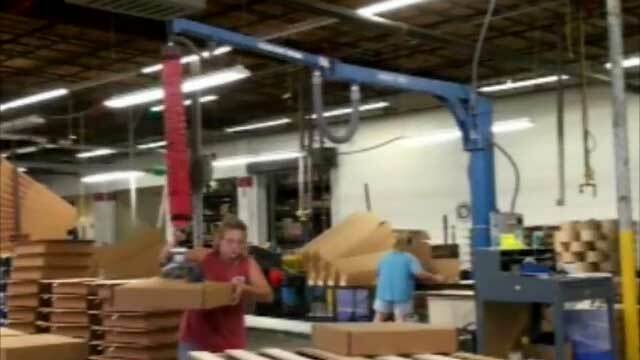 The tool grips and rotates the boxes from horizontal to upright position which allows the boxes to placed into a vertical rack. 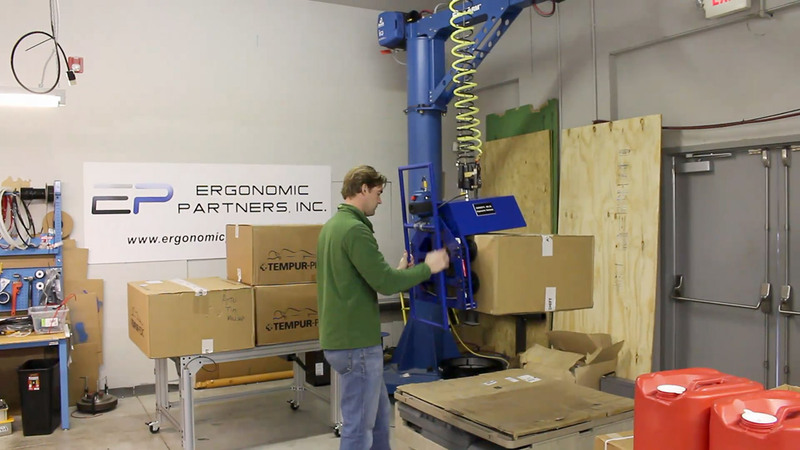 This vacuum gripper is ideal for lifting boxes up to 50 pounds. The tool features left or right-hand grip controls and our gripper safety circuit to prevent operators from dropping the boxes in mid-air. This tool has a safety check valve and vacuum blow-off for non-porous parts. 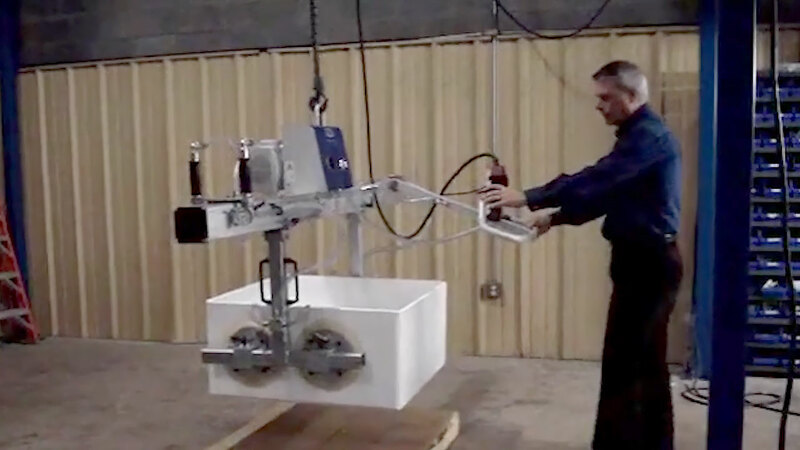 Custom 10 Cup Vacuum Lifter was designed to lift and rotate up to 300 pound sheets of plywood. The tool is supported from a VFD Lodestar Hoist and is powered by venturi vacuum. Due to the porous nature of the product several cups were needed in order to overcome the vacuum losses. 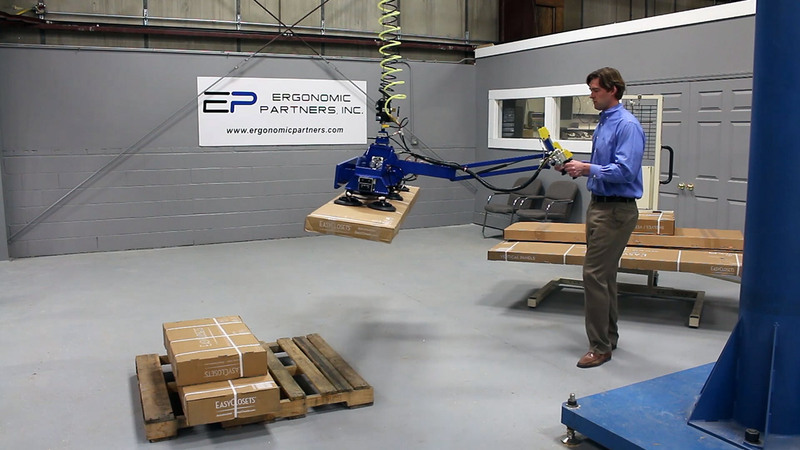 This tool is designed to lift up to 100 pound boxes from a conveyor and palletize them for shipment. Due to the random nature of the packaging, the vacuum cups are on a powered pneumatic adjustment. 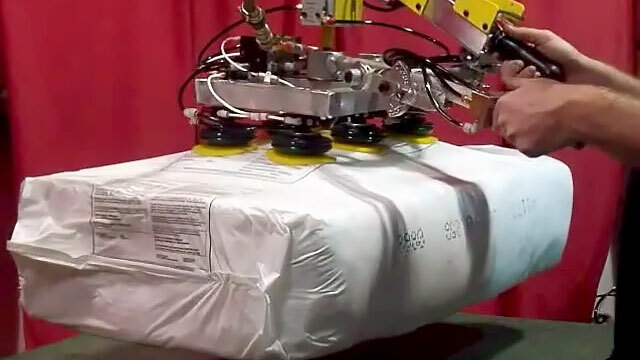 This vacuum bag lifter uses a venturi pump to create suction and has a ergonomic floating handle, and a pneumatic two-hand safety switch to prevent the operator from releasing the bags in mid air. 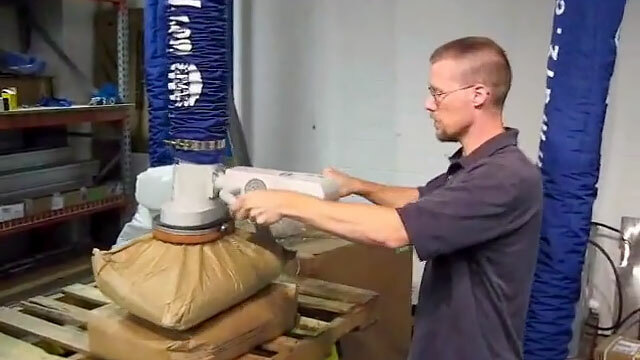 This vacuum lifter has a special vacuum cup that allows picking up rough textured surfaces. 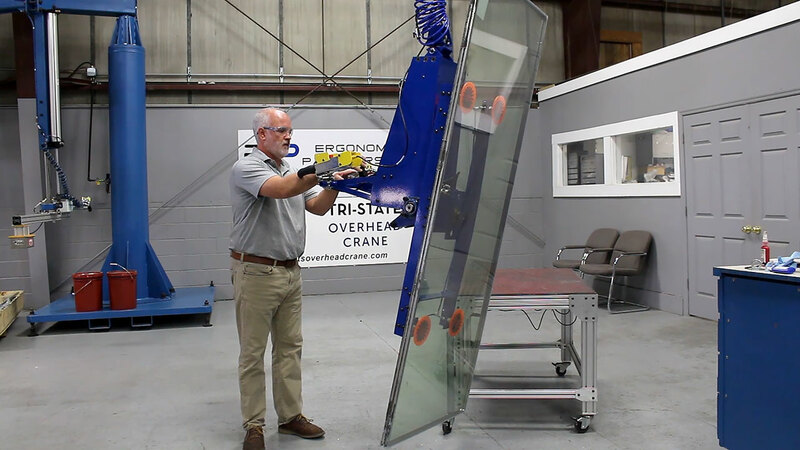 Watch this vacuum video to see how easily our vacuum gripper system can rotate 60 pound glass doors with a proportional electric hoist. Designed to lift and transfer 140 pound batteries with two cups and 70 pound battery with 1 cup. The tool has an interchangeable head to go from the 1 cup to 2 cup design, and can be changed in 20 seconds. 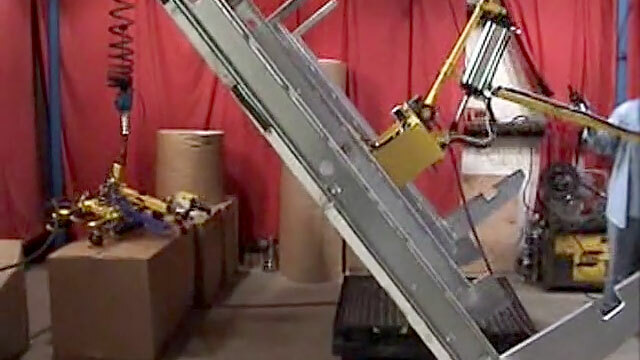 Side box vacuum lifter for stacking and palletizing flexible boxes weighing up to 40 pounds. This compact vacuum gripper is easily adjustable for different size boxes; and can lift up to 95 pounds. Top box vacuum gripper with multiple small cups for flexible boxes. Pneumatic cylinders quickly adjust the width of the cups to handle a wide range of box sizes and widths. 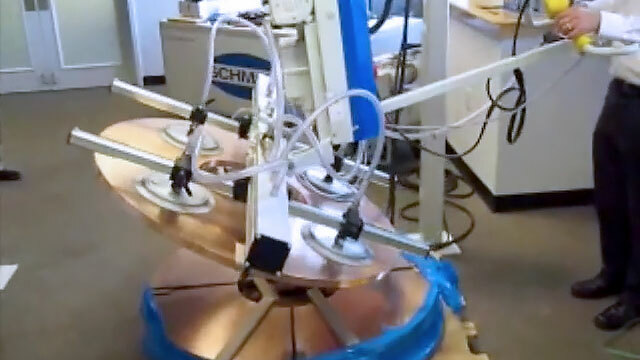 Vacuum gripper utilizing a Gorbel G-Force for lifting un-ground silicon ingots. 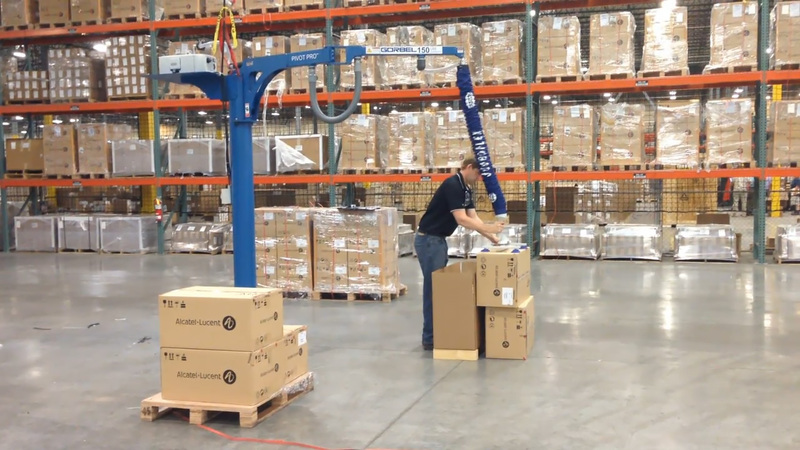 Vacuum lifter for stacking and palletizing boxes weighing up to 65 pounds and uses the JumboFlex along with a PIVOT PRO articulating jib crane. 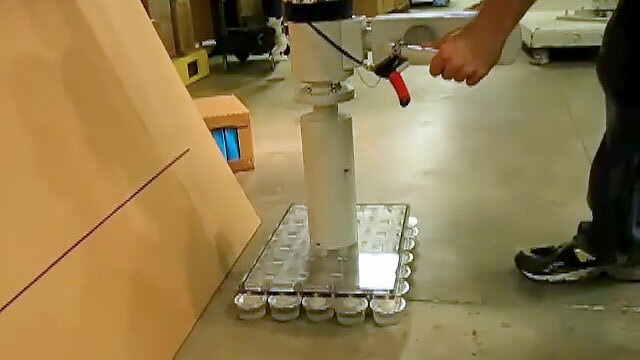 This tool is designed to grip large refrigeration cabinets with just a single suction cup. 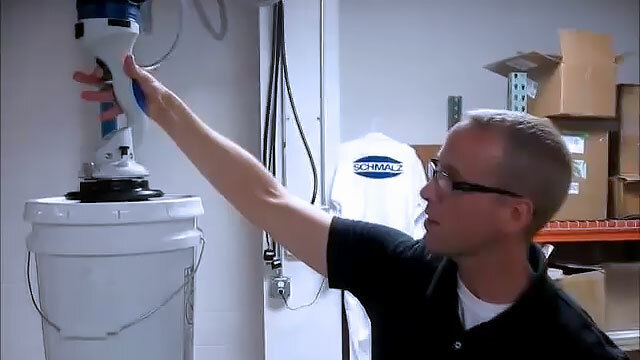 The tool uses an ergonomic high/low force sensing handle with no up/down controls allowing for smaller coolers to be lifted and placed into larger cabinets. The tool is integrated with a Gorbel Easy Arm intelligent hoist and features include powder coated steel and aluminum frame, vacuum grip gauge, float mode, vacuum saving suction cups, high/low grip and release controls with a common button to prevent accidental release of the cabinets in mid-air. 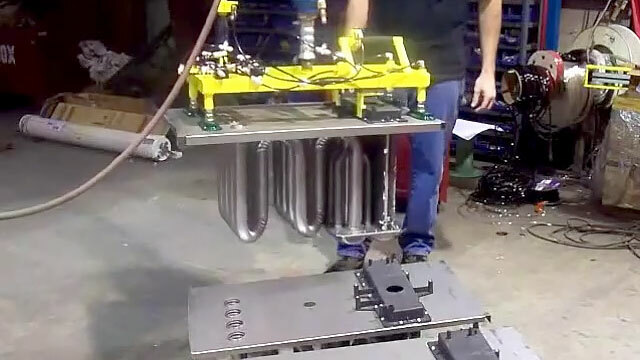 This custom vacuum tool is designed for lifting different width refrigeration cabinets. Width adjustment of the suction cups uses a momentary switch integrated with a custom rack and pinion system. Other features include powder coated steel and aluminum frame, vacuum grip gauge, vacuum saving suction cups, high/low ergonomic handle controls with an air powered rodless cylinder, and our gripper safety circuit preventing accidental release of the cabinets in mid-air. 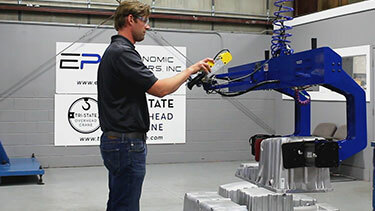 Vacuum lifter for stacking and palletizing boxes weighing up to 100 pounds and reaching up to 100 inches. This vacuum lifter floats the load in the vertical direction. It does not have up/down operator controls, nor does it have grip/release controls. 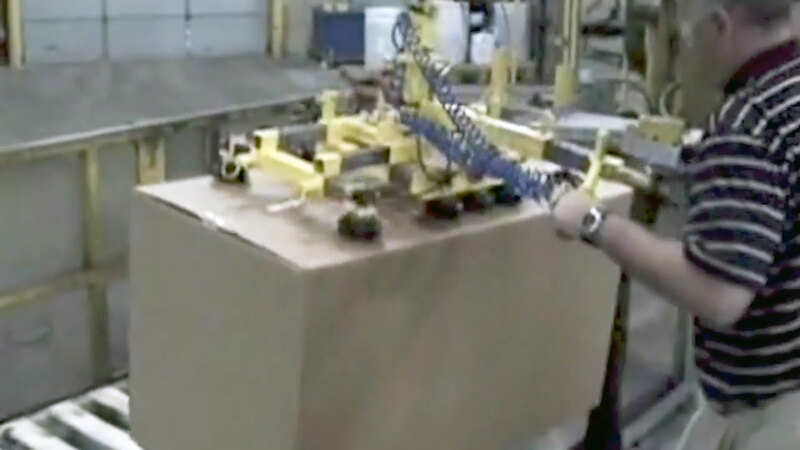 The tool is completely self-actuating, and is ideal for palletizing and depalletizing boxes coming off a conveyor. It grips on the side of the box, so it can also handle open top boxes. 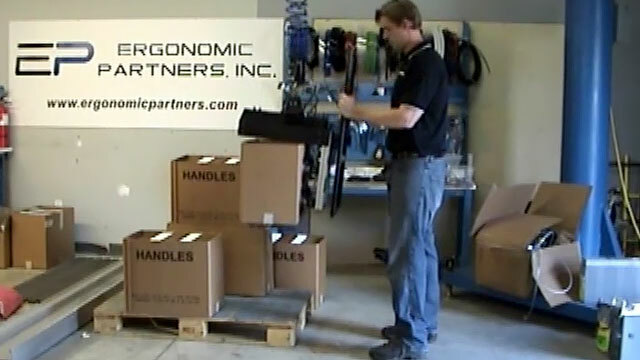 Pneumatic lifting device for loading 180 pound boxes on a pallet. Mechanical tool for lifting 120 pound heat exchangers integrated with a Gorbel G-Force hoist. The tool uses a vacuum cup for stabilization and features an 3 foot adjustable handle. Venturi vacuum gripper for round ground silicon ingots utilizing a Gorbel G-Force for lifting. This vacuum lifter tool is designed to lift and manually pivot HVAC heat exchangers. 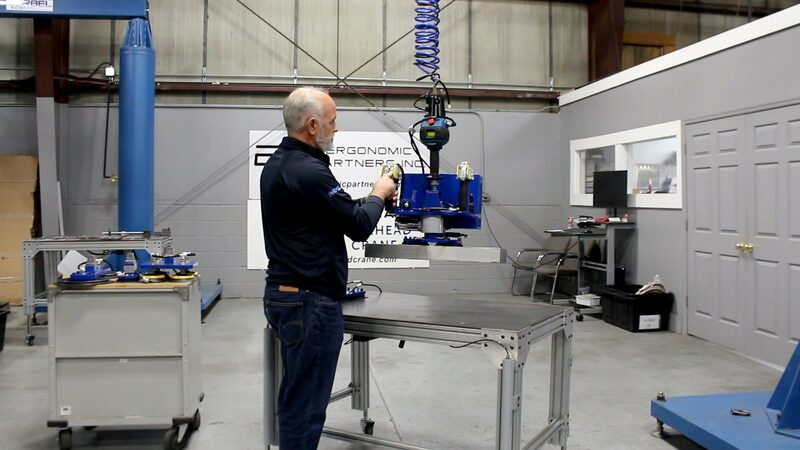 The tool is suspended from a Gorbel G-Force smart hoist. 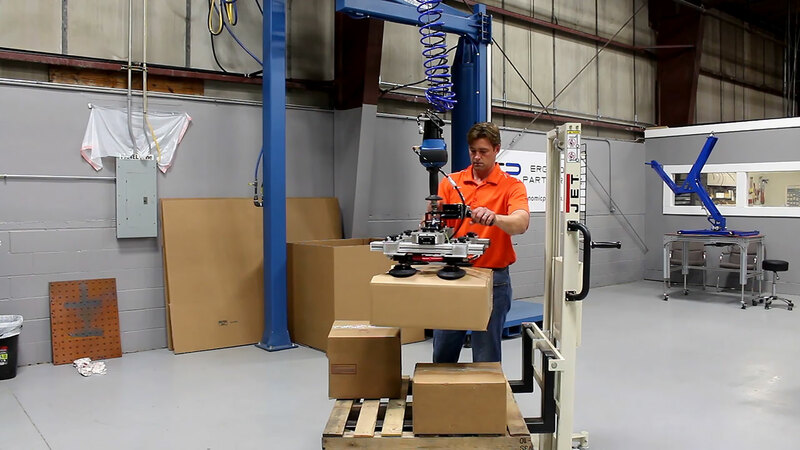 Gorbel Easy Arm integrated with a vacuum tool allowing for the lifting of 90 pound boxes and rotating 90 degrees for palletizing. 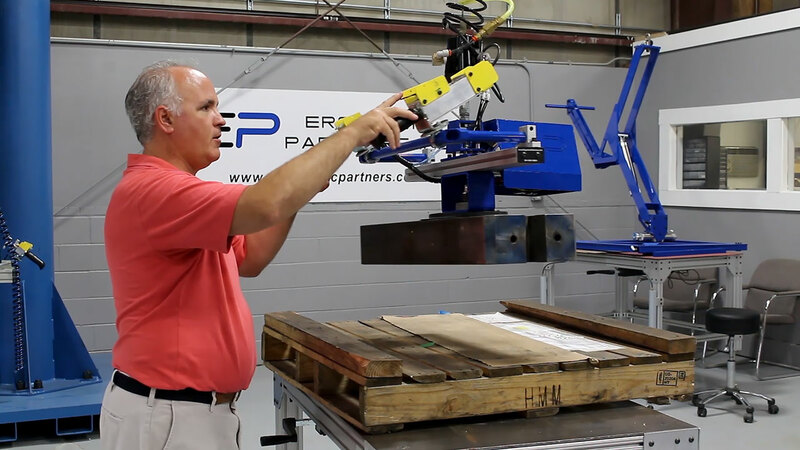 Vacuum gripper tool integrated with a Gorbel Easy Arm for lifting boxes that have open tops. This vacuum gripper cup is designed to lift perforated parts and products the tool is mounted to a G-Force hoist. 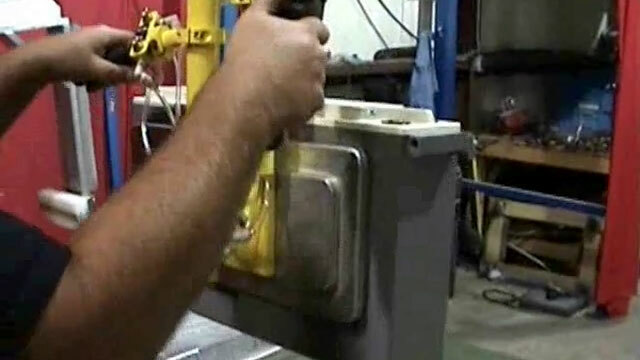 Single cup vacuum lifter for gripping the tip, tails and flat surfaces of the 55 pound ingot. The tool is integrated with a Gorbel G-Force. 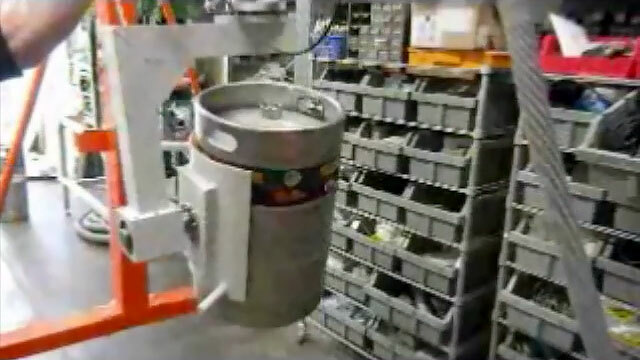 Vacuum cup lifter with 90 degree rotation for palletizing bags of fiberglass insulation. 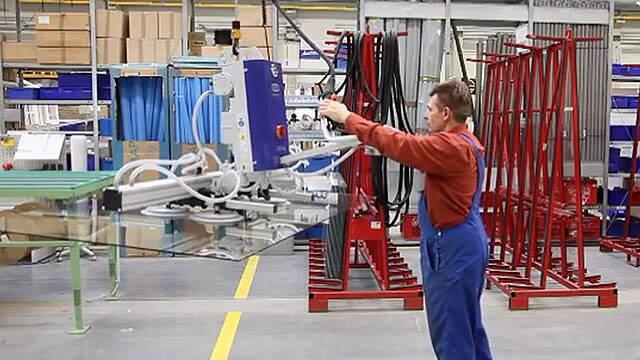 The tool is suspended from a Gorbel G-Force intelligent hoist. These vacuum lifters are designed with a twist grip motorcycle type throttle control handle. This vacuum tube lifting tool is designed with a side gripper, 360 degree rotation, and rigid handle. This vacuum tube gripper lifts and 90 degree pitches 100 pound coils of copper. This vacuum tube lifter is designed for picking up 40 pound sacks. It features a single vacuum cup, 360 degree rotation, and rigid handle with twist grip controls. Vacuum gripper tool for lifting large custom fabricated sheet metal. This keg lifter tool was developed to pick up beer kegs weighing up to 90lbs that had a wide range of diameters. Adjustable vacuum lifter for parts that have different widths, sizes, shapes and capacity loads. This vacuum lifter grips and rotates silicon ingots weighing up to 70 pounds. 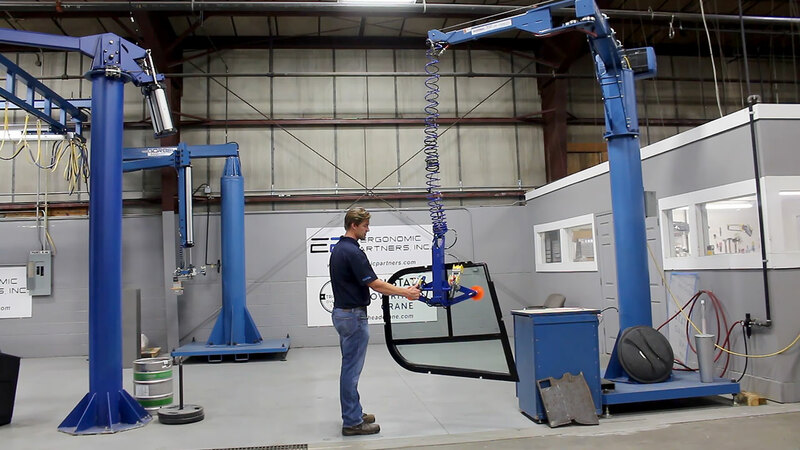 VacuMaster vacuum lifter that picks up and 90 degree rotates glass windows. The lifting device is suspended from a hoist. 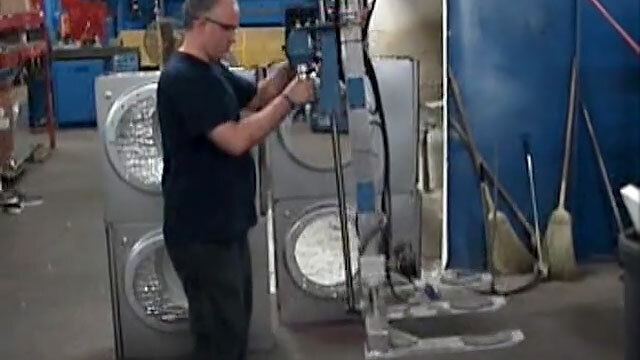 A custom vacuum gripper tool utilizing an electric chain hoist for lifting large quartz crucibles. This vacuum tool is designed to lift 90 pound batteries and is integrated with a Zimmerman air balancer. This JumboFlex vacuum lifter is ideal for picking up small parts. 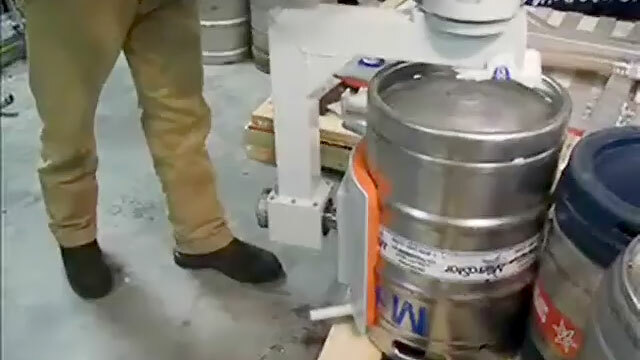 Keg lifter with vacuum suction attachment designed to lift and continuously rotate an 80 pound keg. 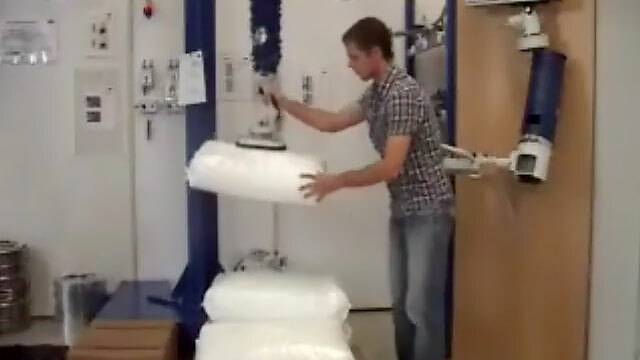 This vacuum lifting device can pitch 90 degrees; making it possible for one person to place the plastic sheets on an upright portable panel rack. 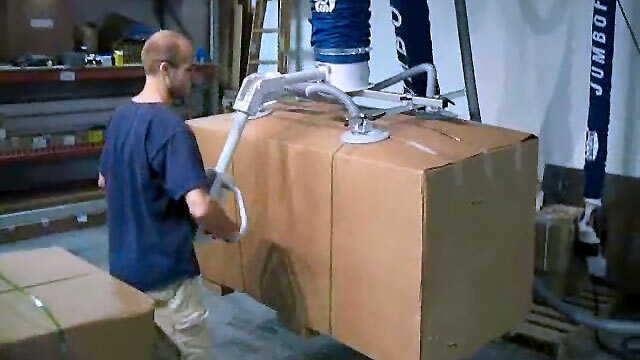 This vacuum lifting device allows transporting 275 pound, cumbersome wooden sheets with minimal effort. The electric linear drive enables rotation of the wooden sheets from the horizontal to the vertical position. The vacuum system has six suction pads, which can be adjusted individually allowing easy movement of different size wooden sheets. 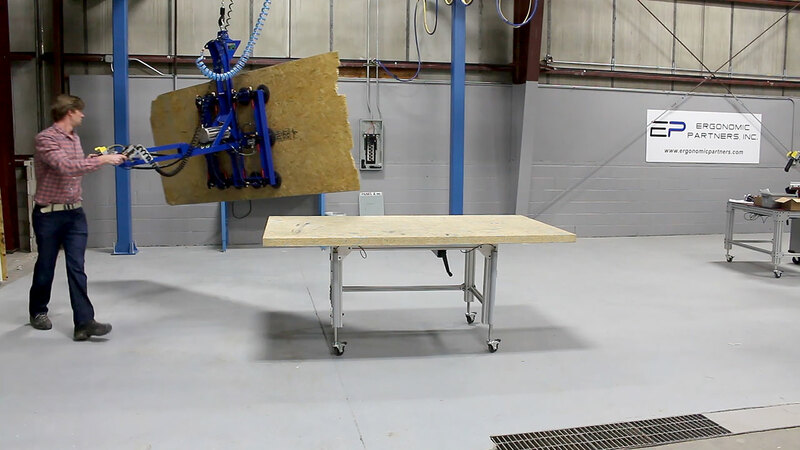 This vacuum lifter is designed to lift up to 275 pounds and rotate wooden sheets by 180 degrees. 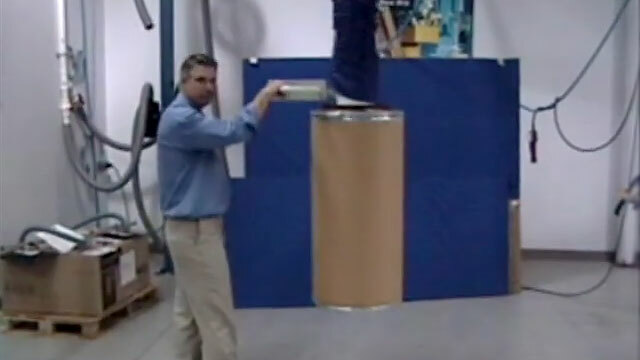 The vacuum system enables a single employee to safely, easily and precisely load or unload heavy wooden sheets. 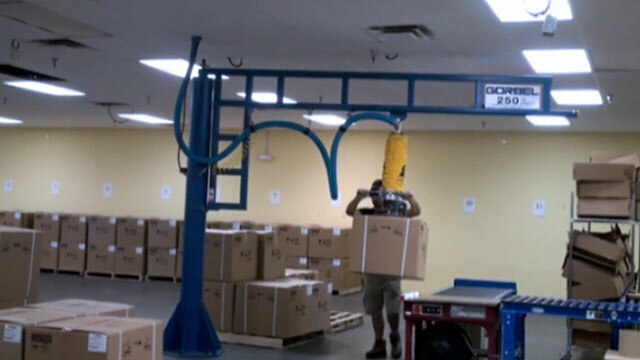 JumboFlex vacuum lifter for lifting and handling bags. 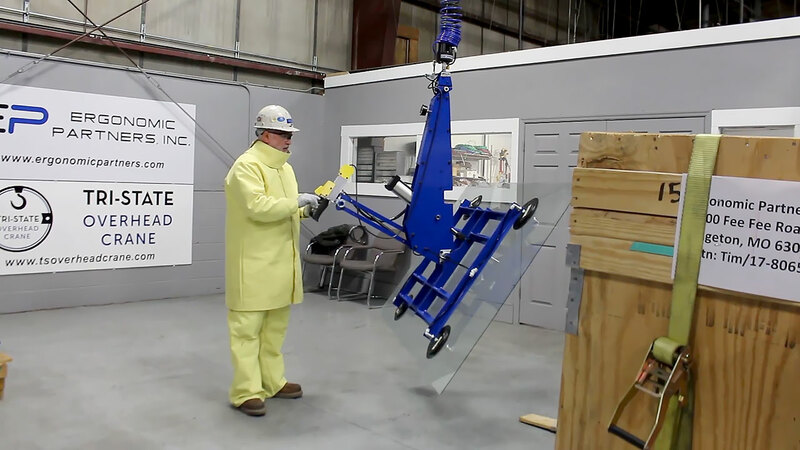 This vacuum tube lifting device is ideal for lifting large sheets of glass. This vacuum tube lifter is the perfect choice for picking up large 250 pound boxes. 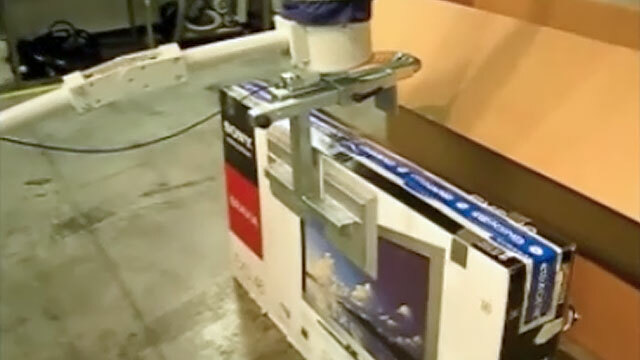 Vacuum tool designed with a side gripper and pivoting handle to lift TV's. 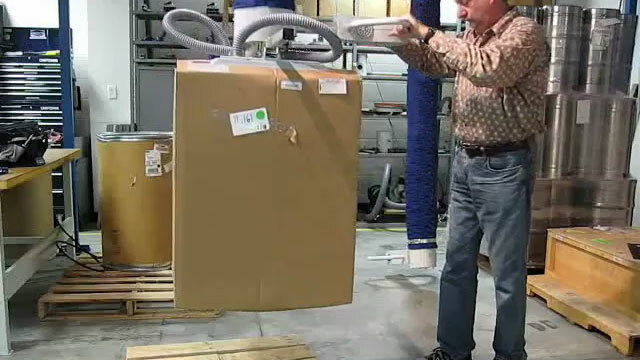 JumboFlex vacuum lifter for lifting and handling boxes. This tool was developed to lift complete layers of food grade cups in a high cycle production environment. This stainless steel vacuum lifter is suitable for food grade applications. 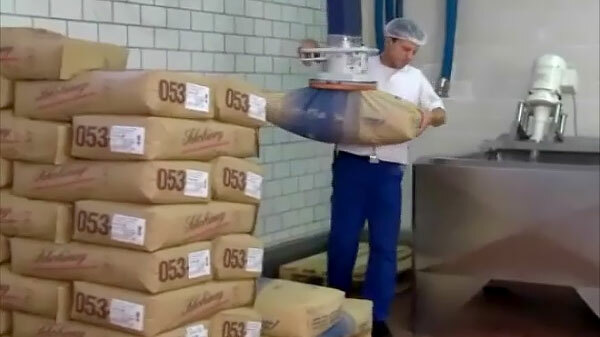 The operator depalletizes the 60 pound bags of sugar onto the mixing stand; then dumps the sugar into the mixer. 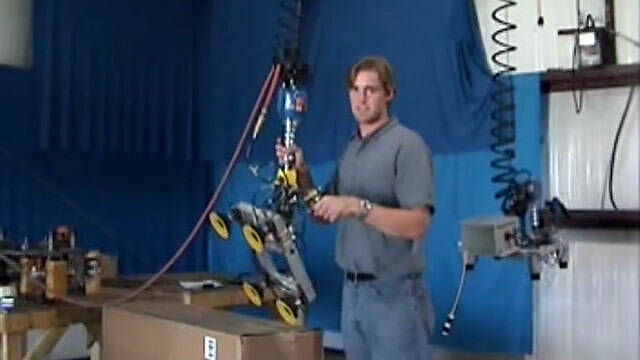 Demonstration video explaining the basic operation of a JumboFlex vacuum lifter. 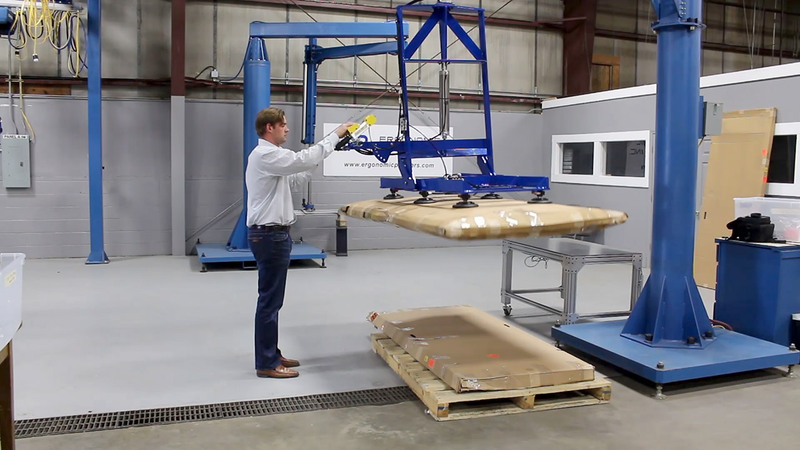 The ideal solution for palletizing 100 pound boxes with a vacuum lifter and a 250 pound capacity Gorbel Work Station Jib Crane. 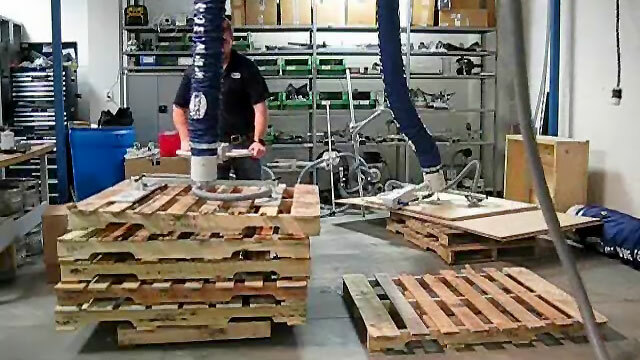 This vacuum lifter picks up wooden closed bottom pallets. Vacuum tube lifter with large grip head to lift 200 pound drums of material. 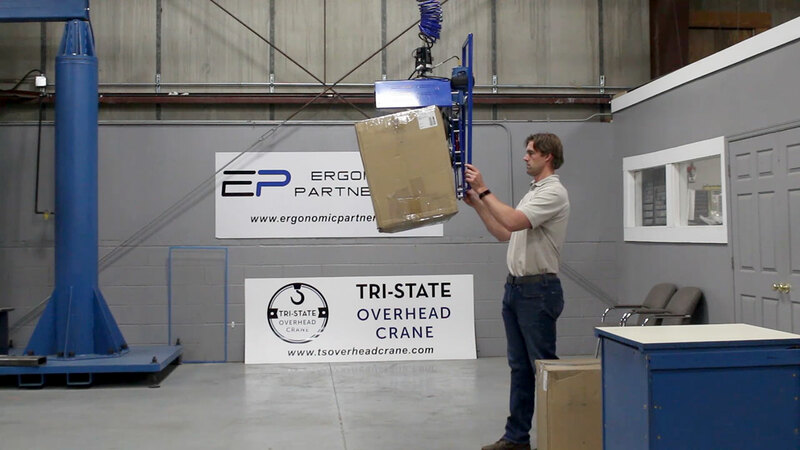 This lifting device is smooth, quick, and precise, allowing the operators to lift the bundles easily.